Long panned for their snooze-tastic designs, Toyota as of late has spiced things up by making some of their cars —the Predator-faced Lexuses, for example — downright terrifying. 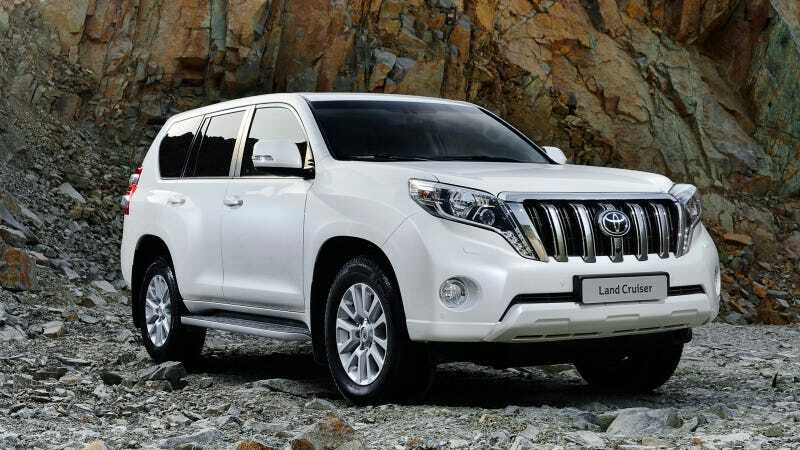 The 2014 Land Cruiser Prado indicates they have no intention of slowing down. First of all, no, this is not the full-sized Land Cruiser SUV that tops the Toyota lineup and is one of the most overpriced new cars on sale. The Prado is a slightly smaller SUV that makes it to our shores as the Lexus GX460. There's no word yet on whether this new Prado will be signing up for Lexus duty, especially since the existing GX just got refreshed with the Predator grille. It's possible it will be replaced with the Prado the future. In the meantime, non-U.S. markets get this baby 'Cruiser with either a 188 horsepower 3.0-liter turbodiesel four or a 282 horsepower 4.0 liter gasoline V6. It also looks like Bane from The Dark Knight Rises, and that's kind of neat. More pics in the press release here.